Francis Vibert De Souza, 73, was not only the first Minister of Amerindian Affairs, he was first and foremost a “fine patriot”, a professional, an entrepreneur, and “a people’s cultural icon”, who composed revolutionary songs and guitar music reflecting the struggles of the Guyanese people. This is according to Prime Minister Moses Nagamootoo and former ministerial colleague and friend, Clement Rohee, who were among those who paid tributes to De Souza prior to his funeral service, which took place yesterday at Our Lady of the Mount Roman Catholic Church, Meadow Bank, Greater Georgetown. RC Bishop Francis Alleyne delivered the final commendation at the funeral service, while Father Paul Martin gave the homily. Minister of Indigenous Peoples’ Affairs, Sydney Allicock, former President Donald Ramotar, former Director of Sport, Neil Kumar, and former United Force Member of Parliament, Michael Abraham paid tribute to the man they described as a brother, confidante and great friend, sharing their experiences working with him at one time or another. Among those present were Minister in the Ministry of Indigenous Peoples’ Affairs, Valerie Garrido-Lowe, former Prime Minister Sam Hinds and former Minister of Foreign Affairs and a former Minister of Amerindian Affairs, Carolyn Rodrigues. De Souza died on December 29, 2018, of a heart attack, two days short of his 74th birthday. He leaves to mourn his widow Rita, four children and several grandchildren. A former x-ray technician, insurance agent, businessman, guitarist, composer and political activist, he was also a devout Roman Catholic. He was a founding member of the Guyanese Organisation of Indigenous Peoples. According to his nephew, Murphy De Souza, on retiring from his ministerial duties, his uncle sought to invest in his childhood home at Cabucalli, Santa Rosa. De Souza, who was a member of the People’s Progressive Party (PPP) for most of his life, had in recent years joined the Alliance for Change but remained a good friend and comrade to his PPP colleagues to the end. He was born to parents who were strong supporters of the PPP. He served as a member of the Central Committee of the PPP, and was a member of the Progressive Youth Organisation delegation to the 10th World Festival of Youths and Students held in Berlin, capital of the then German Democratic Republic (GDR) in 1973. This was reflected, Nagamootoo said, in his signature song, ‘Guantanamera’ which he adopted from the original singer and which sings of an honest man from the land of the palm trees. All those who paid tribute noted De Souza’s love for the song. Guantanamera was sung in Spanish by the choir, which was led by De Souza’s brothers Marco and Dion and his nieces and nephews. De Souza’s lifelong wish, Nagamootoo said, was a Guyana in which all the people would unite. 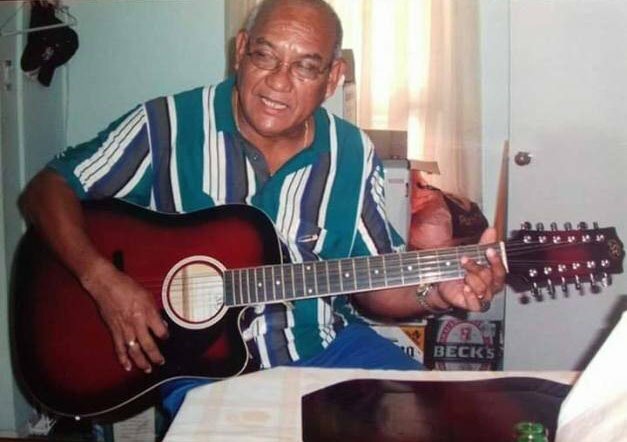 Of his music and musical sessions with PPP party activists, Nagamootoo said with De Souza’s guitar, they always began with ‘Hear Guyana Sing’, after which they would sing creole, patriotic and other songs. He said De Souza revolutionalised and gave life to the creole songs— the songs of Dave Martins, Simon and Garfunkel and the Beatles. “When the word ‘cassareep’ had an honest meaning, Nagamootoo said, he would obtain “pure Moruka cassareep” from De Souza. The PM’s reference to `cassareep’ appeared to relate to an ongoing controversy surrounding former APNU+AFC MP Charrandass Persaud. De Souza not only sang and composed revolutionary songs but he also composed the hymn ‘Mary so gentle’, which was sung by his nephew Murphy and his niece Tiffany on the occasion. Speaking of some of De Souza’s work, which took him countrywide and overseas, Rohee noted that he was inspiring, especially with his guitar and songbook, which he brought with him from Santa Rosa, Moruka, Region One— the place of his birth. He composed the battle songs for the Progressive Youth Organisation, ‘Forward with the PYO’, and for the Women’s Progressive Organisation, ‘Women Unite, Stand Up and Fight’. “He even revolutionised the battle song of the party, ‘O Fighting Men,’ Rohee said. “Vibert’s contribution to the PPP is unmatched and his service to the people of Guyana is etched indelibly in the history of his indigenous people, his community and his country,” he stated. While functioning as a cultural attaché to the Guyana Agricultural and General Workers’ Union, Rohee said De Souza composed the battle song of the union, ‘GAWU -The Union Makes Us Strong.’ While serving as cultural attaché, he visited many sugar worker gangs and sang, much to their delight, protest, revolutionary and patriotic songs to boost their morale, Rohee recalled. “Harripersaud Nokta and Basil James, who served for a number of years as party organisers in the North West District, helped nurture Vibert and his two brothers, Marco and Dion. Vibert and Marco joined the Progres-sive Youth Organisation and the People’s Progressive Party in the late 1960’s,” he informed. His greatest achievement was his appointment in 1992 as the first Minister of Amerindian Affairs of the newly democratically elected PPP/C government, Rohee said. He later served as Minister within the Ministry of Local Government.